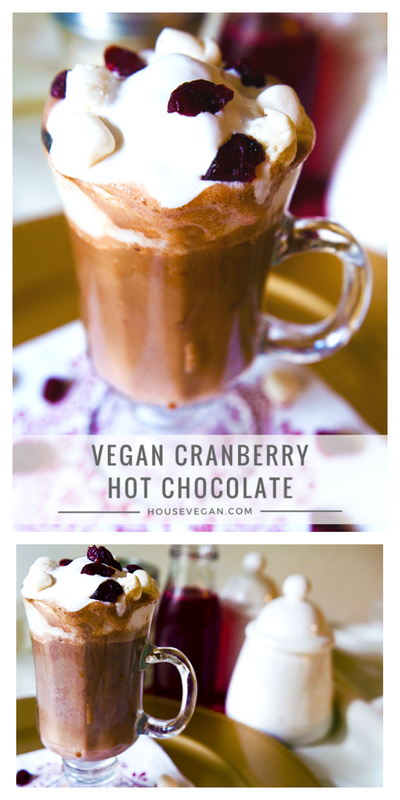 Before telling you about this Vegan Cranberry Hot Chocolate we gotta go to that good ol' disclaimer: Housevegan.com is a participant in the Amazon Services LLC Associates Program, an affiliate advertising program designed to provide a means for sites to earn advertising fees by advertising and linking to Amazon.com. This post contains Amazon affiliate links. I've really been feeling hot chocolate this year. I mean, I'm always feeling hot chocolate, but now I'm like super feeling it. I don't know what it is! Normally I'm all about coffee or tea, but I can't get enough hot cocoa right now. I've had plenty of my Cinnamon Hot Chocolate, a few mugs of the Peanut Butter Hot Chocolate from Fall FoMo No More, tons of peppermint hot chocolate made from Trader Joe's Chocolate Peppermint Almond Beverage, and even some extra delicious hot chocolate made from Taza Chocolate Discs. Our dear friends made us a batch using a chocolate disc during our gingerbread house shenanigans, and it was definitely one of the highlights of the evening for me. So good! Given all of this recent hot chocolate love I figured it was time to see what else I could do with it. I love love love fruit with chocolate - especially berries. Does it get any better than raspberries and chocolate? The first time I had raspberries with chocolate I was in my late teens, and the coffee shop where I worked came out with a special raspberry mocha for Valentine's Day. It was one of the few seasonal drinks that could be veganized so I drank a ton of them. I was hooked, and still am. There's something about raspberries that just beats out strawberries, bananas, apples, etc. when it comes to fruit and chocolate pairings. That memory popped up in my brain when I was trying to come up with a new holiday hot chocolate recipe, and it gave way to this combo. I knew it was going to be a little tough given chocolate's bitterness and cranberry's tart nature, but I went with it for the sake of my weird preferences this year. Every winter I tend to gravitate towards the same types of flavors and scents. You know, lots of warming vanillas, apples, and spices with the occasional chocolate something-or-other. This year though I'm really into the freshness of the season. Spruce, herbs, citrus, and of course cranberries. Maybe the weather hasn't gotten cold enough yet for me to seek out those warming things, or maybe I've been enjoying the crispness of the season. Which would be a crazy turn of events because I notoriously hate winter. Either way, I like what it's inspiring in my food. 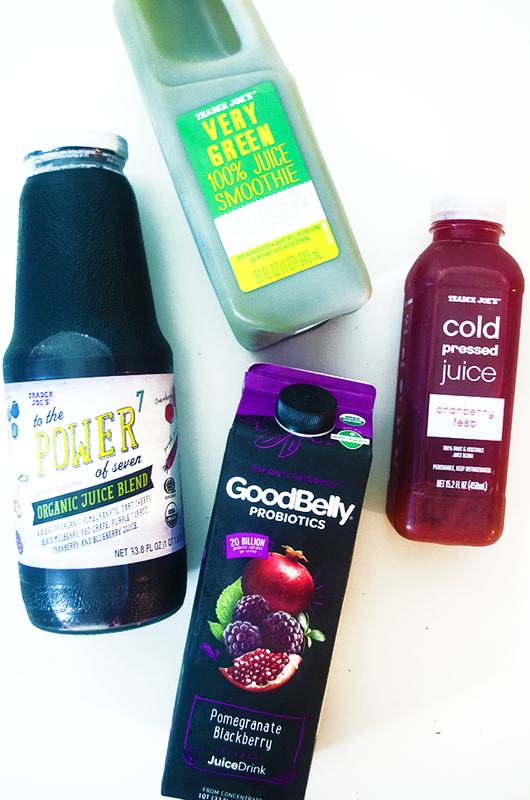 It may be Christmas, but we're just sitting over here enjoying our oranges and juices. Well when we're not enjoying hot chocolate and Pecan Pie Cookies obviously. 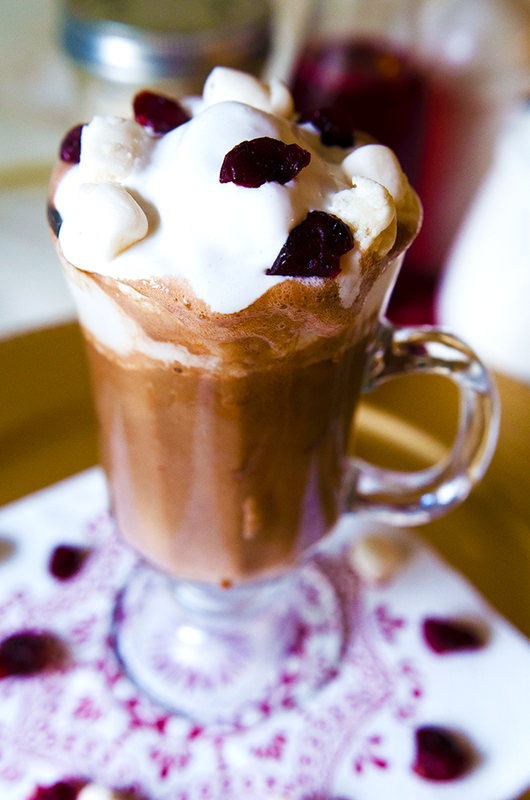 This Vegan Cranberry Hot Chocolate is the perfect melding of my current hot cocoa kick, and my fresh wintery mood. The tartness of the cranberries comes through, but on the backs of sweetness and great fruity flavor. It's a very pleasant and festive combination. 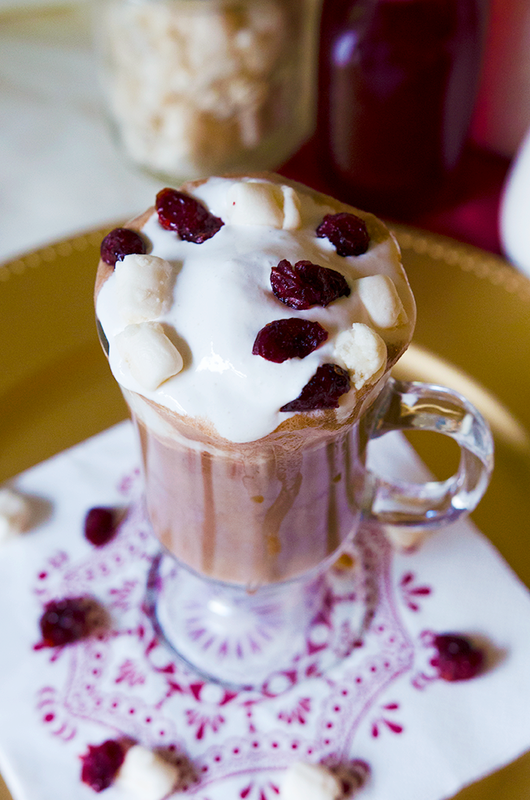 This recipe makes a decent amount of cranberry syrup so you'll have enough for a few mugs of this delicious Christmassy vegan hot chocolate. To answer the question that I'm sure is on everyone's mind, no cranberries did not replace raspberries as my favorite fruit paired with chocolate. Raspberries will forever be the best 💖. 1. Add the water, sugar, and cranberries to a large pot, and bring the mixture to a boil over medium heat.2. Once boiling, partially cover the pot, and turn the heat down to a simmer. Let the mixture simmer, stirring occasionally, for 10-15 minutes or until the cranberries are soft. 3. Once the cranberries are soft turn the heat down to low and allow the cranberries to simmer for another 10 minutes.4. Pull the cranberries off of the heat, and allow them to cool for at least 30 minutes. After they've cooled down a bit, strain the cranberries over a large mixing bowl using a fine mesh strainer. You can keep the cranberry pulp for another recipe, or discard.5. Carefully transfer the syrup to an airtight container, and store it in the fridge for up to two weeks. It is now ready to use.6. In your favorite mug combine the cocoa powder, vanilla extract, 2 tablespoons of the cranberry syrup, and 1 tablespoon of milk. Mix thoroughly with a fork until you're left with a thick chocolatey syrup. Set aside.7. Warm the 3/4 cup of milk over medium heat until it reaches your desired temperature. 8. Pour the warm milk into the mug with the chocolate syrup and give it a good stir.9. 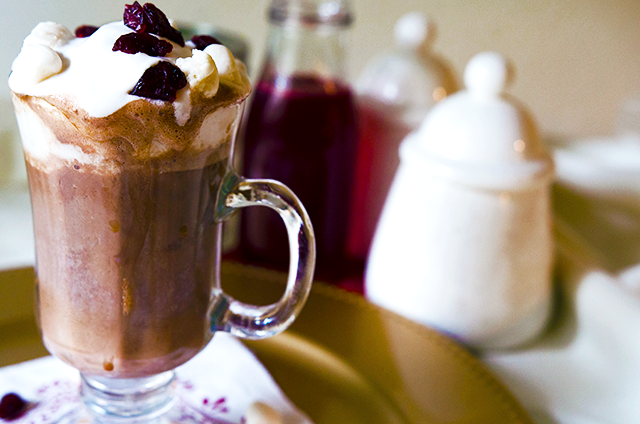 Top your cranberry hot chocolate with whipped cream, dried cranberries, and marshmallows if using. Drink up!